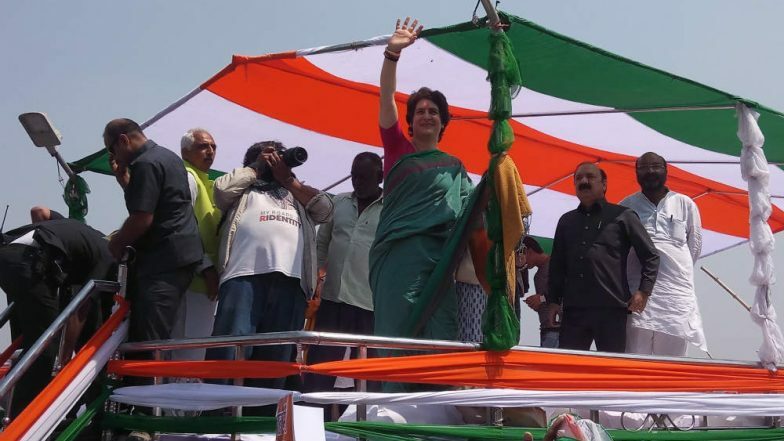 Lucknow, March 19: Priyanka Gandhi Vadra on Monday reacted for the first time after taking as Congress general secretary on the possibility of she contesting the 2019 Lok Sabha election. Upon being asked whether she'd consider contesting the Lok Sabha poll, Priyanka Gandhi said she will do whatever her brother and party president Rahul Gandhi asks her to do. "I want to concentrate on working in Uttar Pradesh. I would like to continue to work for the party and will do whatever the party and Rahul Gandhi asks me to do," Priyanka Gandhi told a news channel. Ever since she was made in-charge of eastern Uttar Pradesh, speculations are rife that Priyanka Gandhi may contest from Uttar Pradesh. Congress sources, however, maintained that she would only focus on organisational work. Priyanka Gandhi Not Be Allowed to Enter Kashi Vishwanath Temple: Lawyers to DM in Letter. Priyanka Gandhi, who on Monday kicked off her three-day long river ride poll campaign from Pryagraj, said she and her brother, Congress President Rahul Gandhi, were fighting for what they believed in, i.e., democratic values. "My brother is the only one who is directly fighting them (BJP) and he will continue fighting no matter what the outcome is because we are fighting for what we believe in. And we believe in this country, in its democracy," she said. Priyanka Gandhi also said her party's aim was to defeat the Bharatiya Janata Party (BJP) and also that of the SP-BSP combine, and added the Congress had no qualms about forging an alliance with "anyone". When asked if the Congress would go it alone in UP in the Lok Sabha elections, Priyanka said: "We are also contesting elections, we are doing it alone. But we have no reservations (about patching up) with anyone, nor do we want to disturb anyone." The Congress leader is undertaking a boat ride from Prayagraj to Varanasi in the Ganga. On her three-day journey, she will meet people in various towns located on the riverbank.